RIVERSIDE, Calif. — Spring is a busy time for bumblebee queens. After emerging from hibernation, their to-do list includes making nests, laying eggs, and keeping their larvae warm and fed. It's physiologically demanding, and the stakes are high: the success of the colony depends on a queen's solitary work during this time. Led by Hollis Woodard, an assistant professor of entomology, the team found that exposure to a widely used insecticide and a poor diet negatively impacted bumblebee queens' health and work, which could have dramatic consequences on an already dwindling pollinator group. 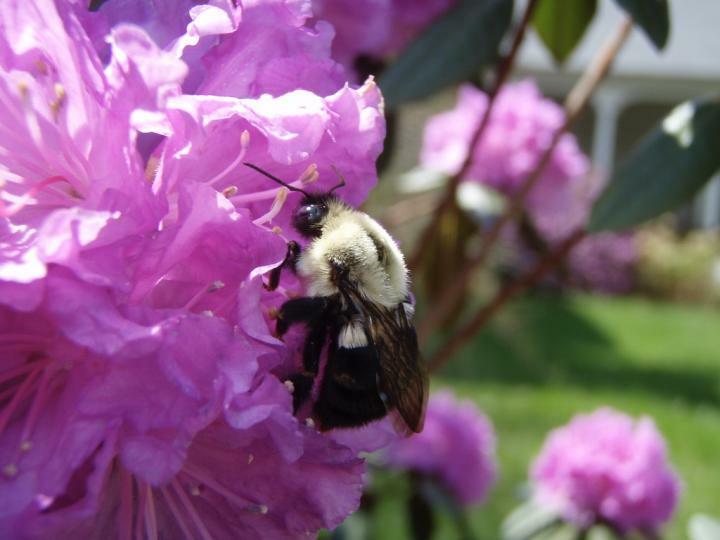 "Queens are probably already a bottleneck for bumblebee population dynamics," said Woodard, whose group studies how bees are adapting to climate and environmental changes. "If a queen dies because of exposure to manmade stressors, then a nest full of hundreds of important pollinators simply won't exist." Previous studies have implicated insecticides, including the widely used neonicotinoids, with a decline in pollinators. While neonicotinoids are usually applied to seeds, they contaminate soil–where bumblebee queens hibernate–and make their way into plant tissues, including pollen and nectar. "Bumblebees are floral generalists that collect pollen from a wide variety of plant species, and there is evidence from previous studies that a mixed diet supports bumblebee colony development better than a diet comprising pollen from a single flower," Woodard said. Woodard's team tested the effects of temporary or sustained exposure to the neonicotinoid imidacloprid and a single-source pollen diet on queens' mortality, activity, and ability to establish healthy nests. "Ours is the first study to explore the impact of multiple stressors on bumblebee queens during an understudied but important phase of their lives. It joins a small but growing body of research suggesting there are unique effects on queens that can have dramatic consequences for future generations," Woodard said. "Our research suggests there are hidden costs to insecticide use that may only be observed if you consider the totality of an organism's life history. This is intricately linked to human well-being because bee heath is extremely important for food production, biodiversity, and the environment," she said. The title of the paper is "Effects of neonicotinoid insecticide exposure and monofloral diet on nest-founding bumblebees." In addition to Woodard, authors are Mar Leza, a visiting scholar in Woodard's lab and first author on the paper; Kristal Watrous, an assistant specialist; and Jade Bratu, a recent UCR graduate who completed the work as an undergraduate Honors researcher.